In a word: unsettling. 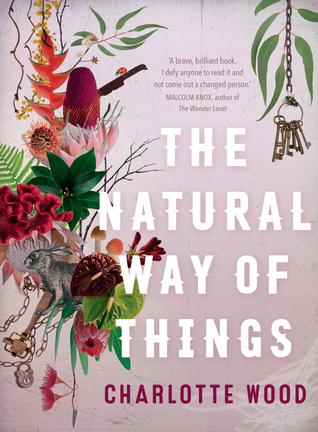 The Natural Way of Things is an unusual book, so far removed from my reading comfort-zone that it is difficult to articulate how I feel about it. On one hand I read it in a single day and found it quite engaging, yet on the other hand I can’t say that I found reading it enjoyable, though considering the subject matter that is probably the point. The story centres around 2 young women who wake up from a drugged stupor and find themselves held against their will in an unspecified part of outback Australia. There are eight other women –some more memorable than others- held along with them. Under the heavy hand of their two male captors they are all put to work on various tasks in the sweltering desert heat. Slowly they come to realise what they all have in common, they have all been at the centre of a sexual scandal with a powerful man or men. I have an uncorrected proof version, and the blurb reveals far more of the plot than this, but for the sake of your enjoyment of the story I will leave it there. I really enjoyed the way the characters developed throughout this story. Verla and Yolanda each have reacted very differently to the scandals they were involved in, and adapt in different ways to the trauma they experience. They were really well written, each giving insights into the female experience of violence, oppression and discrimination in modern society. I also liked the flow and pacing of the story. It unfolded with slow burning intensity, the drama building up like an incoming storm rolling over the horizon until it eliminates any trace of blue from the sky. The only thing I really disliked about this book is the thing that other reviewers seem to love, and that is the way in which it explored the power dynamics between men and women. Perhaps it is because I am not used to reading contemporary literary novels, but I found the themes to be explored inconsistently, and left frustratingly open. The male characters are paper-thin, feeling like place-holders rather than actual people at many points. This is such a stark contrast to the vividly realised female characters that I can only hope that it was a deliberate device. There is a deep undercurrent of rage running throughout this novel, but it never quite comes to the surface. For me this caused the book to suffer, but I think for other readers this will perfectly capture how they feel about issues of gender inequality. There is a real sense of powerlessness pervading every word on every page, which makes it a not altogether pleasant experience to read, but does not diminish the accomplishment with which it is written. Lovers of contemporary Australian literary fiction will love this one, but for me it is a reminder of why this genre hardly ever make into onto my ‘currently reading’ list.